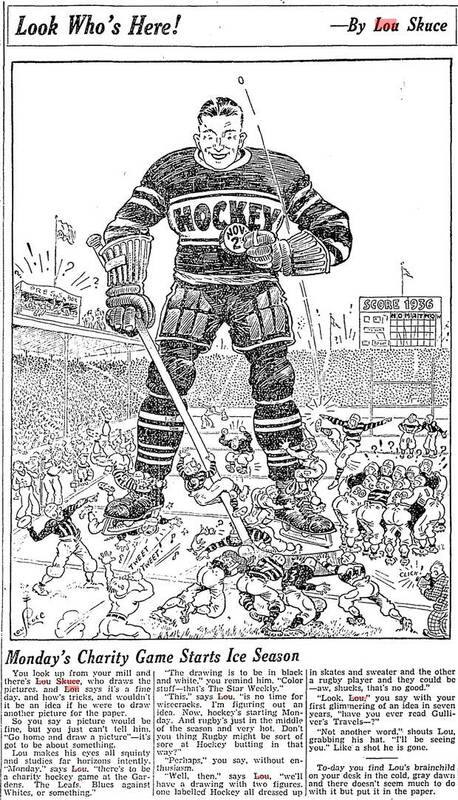 By the time of Lou Skuce's death in 1951, he was regularly billed as "Canada's Greatest Cartoonist." But today, the Ottawa-born, Toronto-based artist, commercial illustrator and vaudevillian is all but forgotten – a four-decade-long career lost in the margins of art history. Next month, Taddle Creek magazine will publish Conan Tobias's feature chronicling Skuce's remarkable life and legacy. Below is an exclusive excerpt. 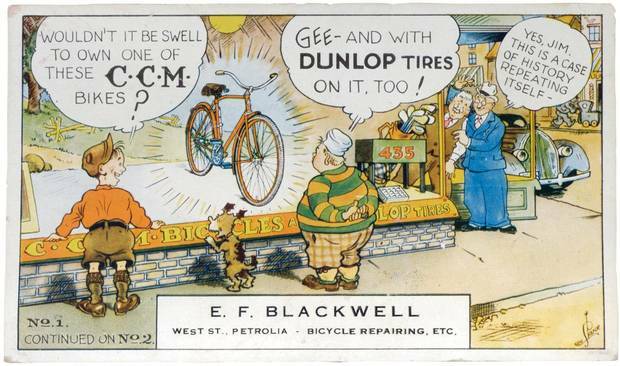 Around January, 1929, an advertisement for Buckingham cigarettes began appearing in Canadian newspapers. It featured a photograph of cartoonist Lou Skuce, dressed in his shirtsleeves and vest and sporting a trim flattop haircut, with a lit cigarette drawn into his right hand. Surrounding him were illustrations of his popular characters Mr. 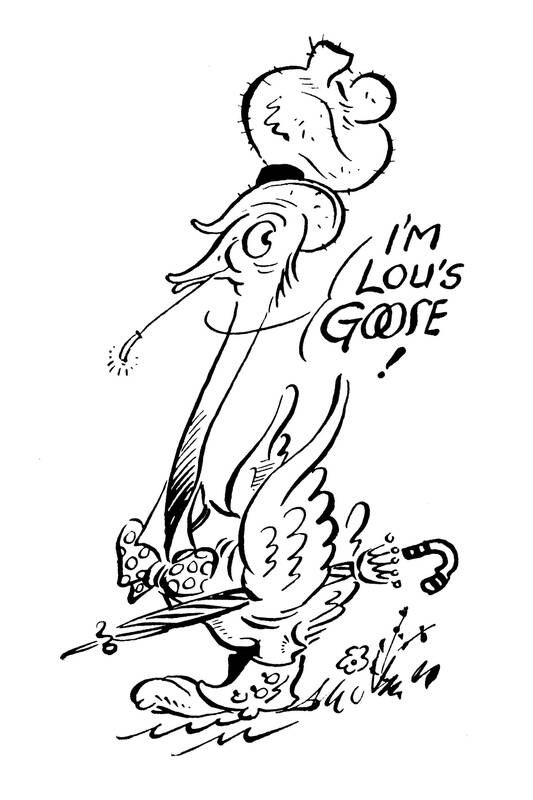 Fan and Lou's Goose, along with four caricatures representing Politics, Sport, Fashion and Drama. It read, "Lou Skuce, famous Canadian cartoonist, repatriated from New York by the Toronto 'Mail & Empire,' says: 'Buckingham is sure throat-easy. It's one of the good things Canadians miss when they cross the line.'" Such endorsements today would be unheard of for a newspaper cartoonist – a dying breed practising a dying art. Many of Skuce's contemporaries became household names, but part of Skuce's uniqueness lay in his focus on sports. Much of his time as an on-staff cartoonist for the Toronto Sunday World, a job he held for 14 years before his move to New York, was spent specializing in this area, making him something of a rarity in the Canadian newspaper industry. Conan Tobias will present a talk on the life of Lou Skuce at the Toronto Comic Arts Festival on May 15 (torontocomics.com). A show of work from across Skuce’s career is on display until June 30 at the Jet Fuel Coffee Shop in Toronto. 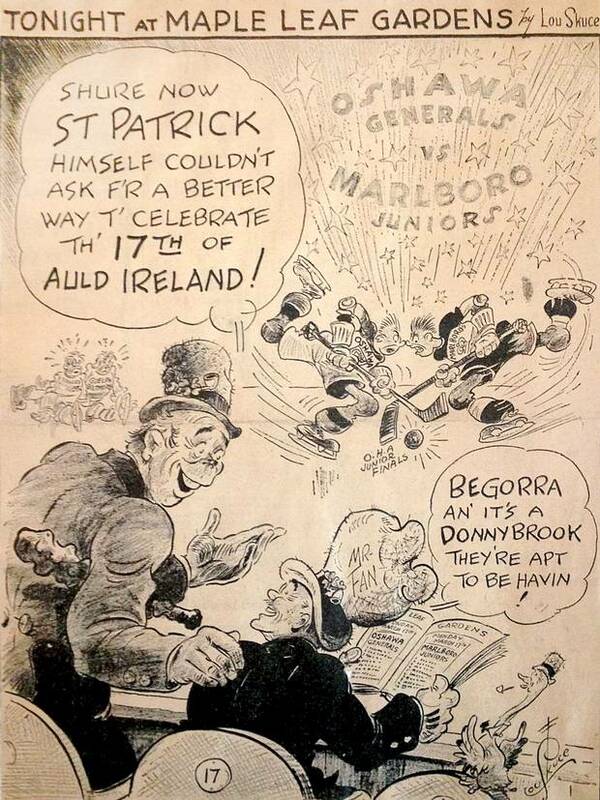 Skuce's sports cartoons could be as much about the business of sport as sport itself, alternating from cheerleading to humorous criticism to compassion, and his position as both caricaturist and commentator was a vital part of the paper's voice. Today, as newspapers struggle for profit and relevance, such a connecting tissue has become superfluous, and sports cartoonists nearly non-existent. But in 1929, despite spending several years away, Skuce's stature at home was as strong, if not stronger, than when he left, thanks in part to his syndicated work, which had given him an uninterrupted presence in Canadian dailies. You look up from your mill and there’s Lou Skuce, who draws the pictures, and Lou says it’s a fine day, and how’s tricks, and wouldn’t it be an idea if he were to draw another picture for the paper. So you say a picture would be fine, but you just can’t tell him, ‘Go home and draw a picture’ – it’s got to be about something. Lou makes his eyes all squinty and studies far horizons intently. ‘Monday,’ says Lou, ‘there’s to be a charity hockey game at the Gardens. The Leafs. Blues against Whites, or something.’ ‘The drawing is to be in black and white,’ you remind him. ‘Color stuff – that’s The Star Weekly.’ ‘This,’ says Lou, ‘is no time for wisecracks. I’m figuring out an idea. Now, hockey’s starting Monday. And rugby’s just in the middle of the season and very hot. Don’t you thing [sic] Rugby might be sort of sore at Hockey butting in that way?’ ‘Perhaps,’ you say, without enthusiasm. ‘Well, then,’ says Lou, ‘we’ll have a drawing with two figures, one labelled Hockey all dressed up in skates and sweater and the other a rugby player and they could be – aw, shucks, that’s no good.’ ‘Look, Lou,’ you say with your first glimmering of an idea in seven years, ‘have you ever read Gulliver’s Travels – ?’ ‘Not another word,’ shouts Lou, grabbing his hat. ‘I’ll be seeing you.’ Like a shot he is gone. Skuce supplemented his newspaper income with advertising work as far back as 1924, when he drew a group of university students staring enviously at a dapper classmate outfitted in the latest fashion from Tip Top Tailors, and an art-deco-style flapper posed beside a McLaughlin Buick, above the tagline, "What more could a man ask for?" Shortly after returning to Toronto, Skuce opened Lou Skuce Studios, located on the penthouse floor, in Room 2202, of 80 King Street West, the Toronto Star's legendary "Superman building," named for inspiring the look of the Daily Planet's building in the comics created by the former Star newsboy Joe Shuster and his childhood friend Jerry Siegel. 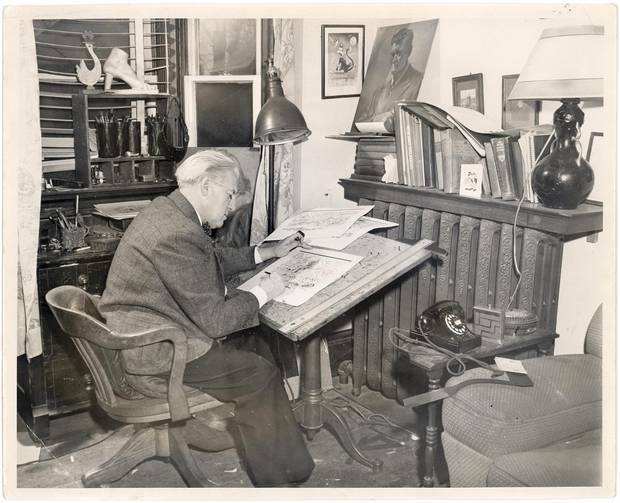 Lou Skuce at work in his home studio (undated). Promotional materials for the studio boasted a staff of "outstanding leaders in commercial art, magazine and newspaper illustration, cartoons and comics." Beside its Toronto address, Lou Skuce Studios listed offices in Montreal's equally impressive Southam Building, as well as rooms in New York, Chicago and Hollywood. A 1931 ad in the Butte, Mont., Standard sought a "state manager with sales and organizing ability to operate on a royalty and bonus basis. State qualifications. No investment required but small working capital helpful. A proposition which will stand investigation. Address general manager. Western Division Lou Skuce Studios. Box 593, Arcade Station. Los Angeles, Cal." More than likely – considering the studio's biggest selling point would have been illustrations drawn by Skuce himself – at least some percentage of Skuce's marketing was clever showmanship. The classified section of Popular Science magazine in August, 1953, listed Skuce's Hollywood address at 5873 Franklin Avenue, in an ad that read, "Hollywood postmark! Letters remailed 25¢ ea." 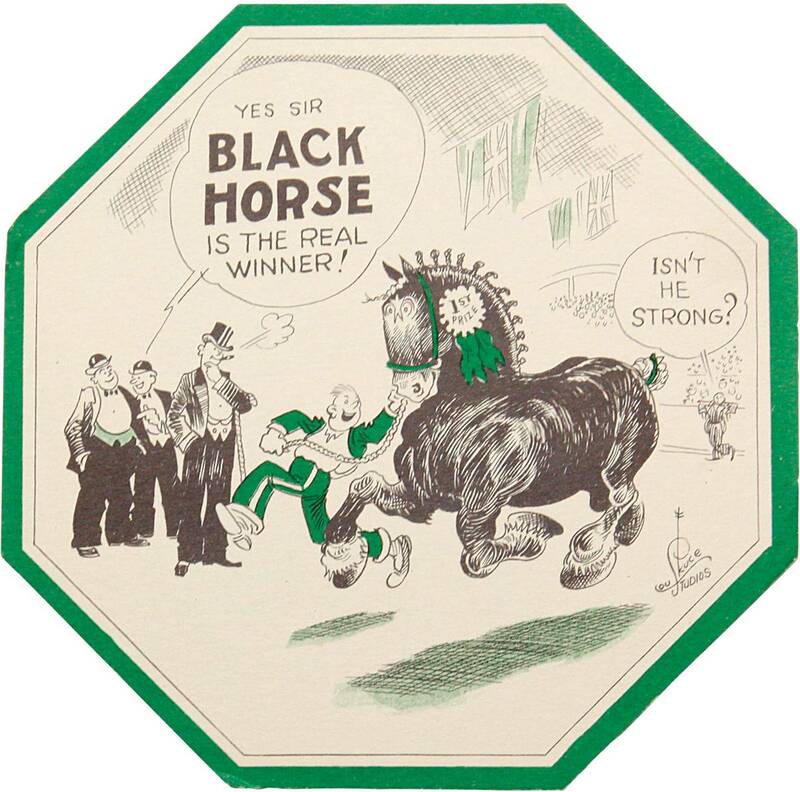 The studio's major output, alongside print advertising, was illustrated promotional "blotting pads," or coasters. A 1931 ad in the Montreal Gazette announcing the opening of his office there said Skuce's "output of cartoon blotters during the past five months is in the millions." Skuce's client list was exhaustive, and included Firestone, Hudson's Bay, General Electric, Imperial Tobacco, O'Keefe's Brewing, General Motors, Spalding, C.C.M., Lipton, Imperial Oil and the Shriners, in addition to local coal dealers, dry cleaners, florists, taxi-cab companies, dairies and bakeries. Skuce's advertising work rarely strayed from the lighthearted working-class humour he'd become known for, often sticking to a setup-and-punchline format: "What this ol' bus needs is more horse power!" the driver of a jalopy exclaimed on a coaster for Black Horse ale. "Yes – Black Horse," replied his passenger, oblivious to the perils of drinking and driving. 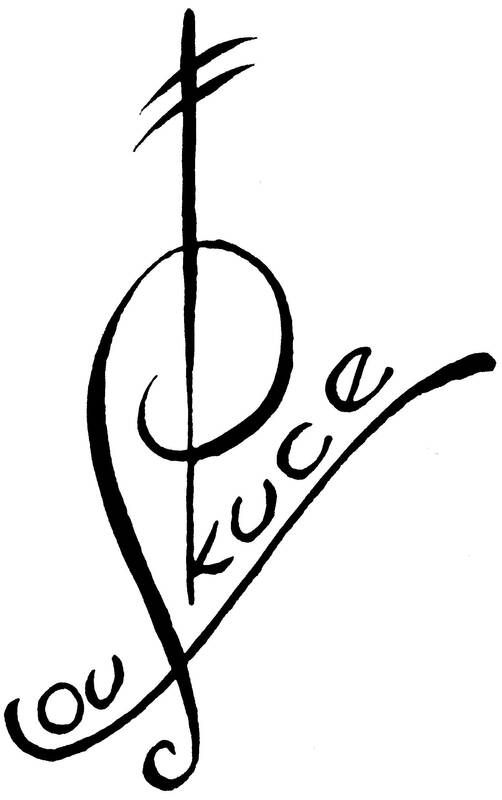 Skuce's illustrations also appeared on a variety of merchandise. 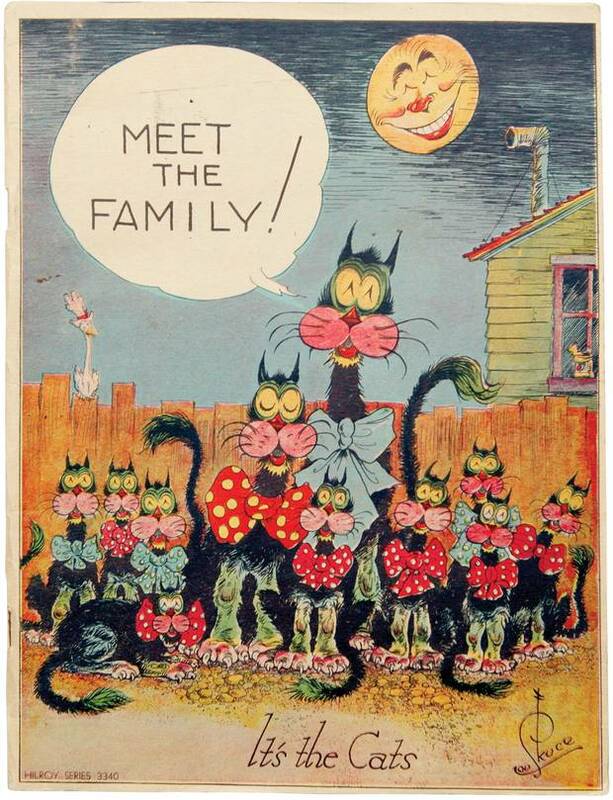 He drew scribbler covers for the Canada Pad and Paper Company, once offered free by Tamblyn drug store with each 23-cent purchase of Minty's toothpaste. In an escalating battle for toothpaste supremacy, patrons of Dr. Gardner's toothpaste could obtain a Lou Skuce jigsaw puzzle of the Stanley Cup-winning 1932 Toronto Maple Leafs. A newspaper ad for the Hudson's Bay Company in Winnipeg instructed boys and girls to "be on hand bright and early Saturday morning" for the 9 a.m. jigsaw puzzle special featuring "Lou Skuce Double Comics." A pound of tea or coffee from Ottawa's Red & White Stores guaranteed shoppers a "75 piece jig-saw puzzle free! A different puzzle … designed by Lou Skuce, the famous cartoonist, especially for Red & White Stores … more than 75 pieces and interlocking … no advertising on the picture, but lots of fun putting it together." And O'Keefe's once produced a confounding set of four blotters advertising stone ginger beer, which the company usually marketed to children. Each coaster was die-cut in the shape of a different playing card suit, and backed with bridge tips "for use at card parties or social occasions where beverages are served. The hostess will find these blotters a protection against the blemishes left by tumblers on bridge tables and other polished surfaces." Skuce was a noted athlete in his youth, winning as many as seven Canadian and one international paddling championship as a member of Ottawa's Britannia Boat House Club – known today as the Britannia Yacht Club. He also played with the original Ottawa Rough Riders rugby team, and at least one season with an amateur hockey club in Winnipeg. As a result, sports remained a major part of his career as an illustrator. Skuce was a regular fixture at Saturday night Maple Leafs games, and encouraged the creation of the Lou Marsh Memorial Trophy, for outstanding athletes, named in honour of his friend, the one-time Toronto Star sports editor. Skuce's own athletic background allowed him to draw especially detailed and accurate sports illustrations. His work in the area shows more consideration of composition than required by his lighter fare, and he was especially adept at balancing the friction between realism and cartoonishness in the single-panel profiles of sports figures that were popular at the time. Skuce once said his toughest assignment had been for Jack Corcoran, the wrestling promoter and owner of the Queensbury Athletic Club, in Toronto. Corcoran became infamous after he was accused of knowing match outcomes in advance. His reputation survived – he denied wrestling was anything but legitimate – and fans continued to turn a blind eye. 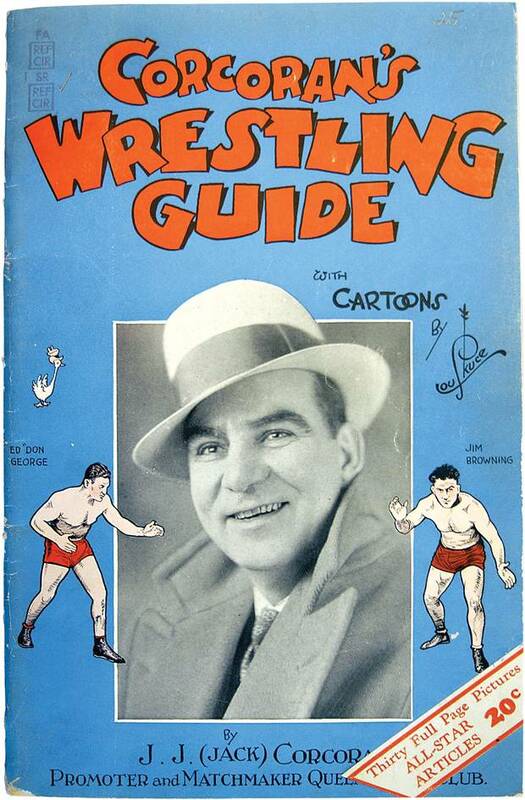 Corcoran's Wrestling Guide, published in 1935, was a 64-page program featuring illustrated biographies of Corcoran's talent. Skuce drew the wrestlers with a sensitivity and elegance that made each look like a champion – even cultural stereotypes such as Matros Kirilenko, "the Terrible Cossack," with his ushanka fur hat; and Jim Clinkstock, shown in full Cherokee headdress. A book of baseball cartoons Skuce drew for the World in 1914 demonstrated his early mastery of single-panel gags, but the Corcoran guide showcased in combination his fully matured talents as a fine illustrator, top-notch cartoonist, and talented letterer. A profile of Skuce in a 1932 Maple Leaf Gardens program called him "a staunch friend of Maple Leaf Hockey Club since its inception." Skuce's portraits of Leafs players and staff hung on the Gardens walls for decades. He drew program covers and, on weeks when it looked like attendance to the Saturday night game might be low, he produced a comic advertisement for the local papers to boost interest. Skuce, according to the profile, had an "unselfish sympathy toward any athletic venture in the Queen City. No matter what time of the day you call on him, or how little time you give him on an assignment, he is always cheerful in acceptance, and prompt in execution." Little record remains of Skuce's work today, though. Unlike his contemporary C.W. Jefferys, who built a name for himself as a master illustrator of Canadian history, Skuce did not become known beyond cartooning, and none of his characters remained in the public consciousness in the way James Simpkins's Jasper the bear or Doug Wright's Nipper continued to after their deaths. Skuce's legacy is a product of the era in which it was made: when cartoons and illustrations were as ephemeral as the newsprint and blotters they were printed on.